A great review from part of the BRITS and BBC Music Awards judging panel. "What a delightful and dazzling night out on a cold and dreary Tuesday", 5 stars. We made the front page of this local periodical. Click on the image to see full size version. A great article about The Silver Ghosts in this popular blog about everything vintage in the UK. An article about us in this newsletter that campaigns for the interests of the Highbury, Finsbury park and Lower Holloway local community. "The Silver Ghosts superb performances pack the place out every time they perform here at St Martin in-the-Fields. We love the wonderful 1920s 30s 40s atmosphere they evoke, and anyone lucky enough to book them would be certain of a high spirited swinging good time!" "Thank you again for performing such a wonderful set for us at The Savoy last night. You were exceptional and I had people telling me all night how impressed they were with you." S Russell - Torus Insurance Ltd.
"The Band were great fun, and perfect for the Great Gatsby theme!" "I wanted to say that the band and [dance teacher] Rosario were absolutely brilliant. We’ve never had so many people dance at this event before." " I want to thank you all for the brilliant show you have done. So many people loved you and they have appreciated your passion and talent. I really hope to work with you in future. Please extend my congratulation to all the rest of the band." 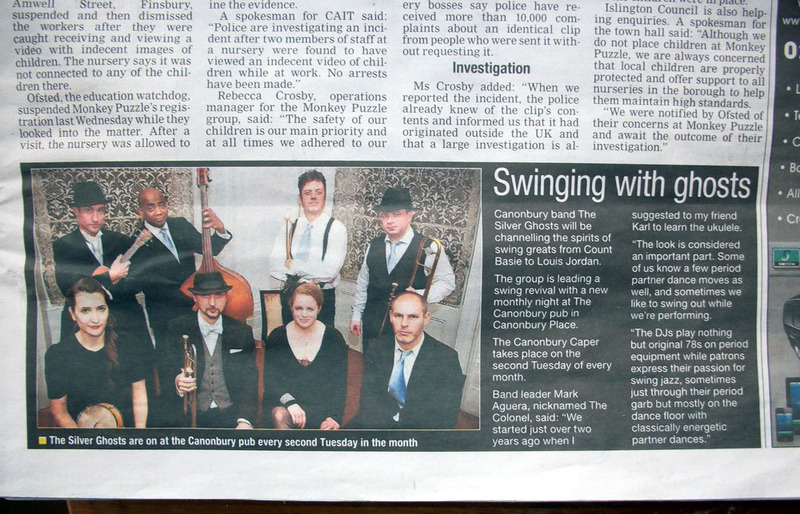 "They provided hot swing from the Golden Era of Jazz all night at our weekly Friday swing night. They created such a great atmosphere with plenty of patrons swing dancing along to the music. I intend to book them for future events at Servant Jazz Quarters, they are a very popular choice of band for this night." "What a fantastic evening we had, the band were magnificent and contributed enormously to the fun ambience of the evening." "Your band helped the evening start with a bang!. Great music, incredible female singing voice, many of our guests commented on how brilliant the band were, and just what we needed in keeping with the theme of the day." "They play great up-beat Swing Jazz that is an ideal tempo to dance to. The Silver Ghosts have played for our swing dance nights and our dance classes at The Salisbury Hotel Pub in North London. Their song choices represent a fantastic selection of 1920s to 1940s Hot Jazz. They also have a very friendly and easy to liase with team that is always well turned out." "I wanted to thank you and all of The Silver Ghosts for the absolutely amazing performances you gave at our wedding on Saturday. Everyone was particularly complimentary for the music you played before and during the service. We can't think of a better way to have walked down the aisle and Bei mir Bist was particularly beautiful." " The Silver Ghosts were perfect and really made the party. Excellent Performance. Thank you for making my party one to remember." "Thank you so much for some brilliant music at the wedding - it really helped to make the night such fun." "It was simply fabulous. Loved the music, loads of my favourite tunes, & the atmosphere the band provided. We also liked the way you completed your professionalism with the look... had a wow evening... fabulous singer. BTW, did love the clarinettist too - beautiful Artie Shaw bloom in his sound. " "Heavens !!! What a simply fabulous treat...The Silver Ghosts were delightful and engaging"
"Great music, fantastic vocals by Lucy, I loved the repertoire of my all favourite songs! " "All I can say is WOW!! I had an excellent time, great band, Lucy was great. "